This book covers the different types of wireless industries, their regulation, the wireless technologies they use, and what services they can provide. An overview of telecom voice, data, and multimedia applications is provided along with the fundamentals of wireless technologies. Analog and digital mobile telephone systems are covered including analog cellular (1G), digital cellular (2G), packet based cellular (2.5G), and wideband cellular (3G) communication systems. 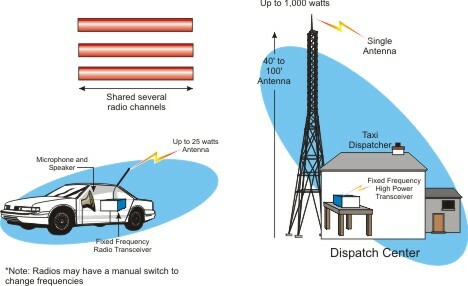 Private land mobile radio (PLMR) dispatch and two-way radio systems are explained as well as how they are changing to advanced digital communication systems. Mobile data basics are provided along with the available types of packet and circuit switched data systems. One-way and two-way paging systems are described and how they are evolving into interactive information services. The types of satellite systems and their characteristics are also covered. This diagram shows a 3rd generation broadband wireless system. This system uses two 5 MHz wide radio channels to provide for simultaneous (duplex) transmission between the end-user and other telecommunication networks. 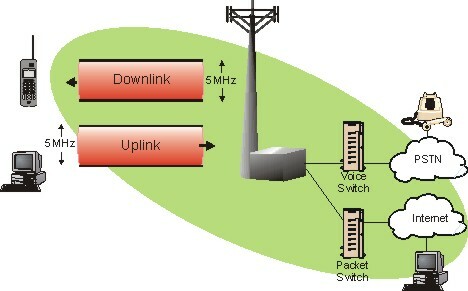 There are different channels used for end- user to the system (called the "uplink") and from the system to the end-user (called the "downlink"). This diagram shows that 3G networks interconnect with the public switched telephone network and the Internet. While the radio channel is divided into separate codes, different protocols are used on the radio channels to give high priority for voice information and high-integrity to the transmission of data information. 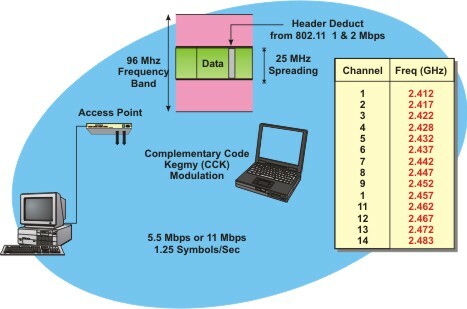 This diagram shows the basic radio size used in the 802.11b system. This example shows that the radio channel in the 802.11b system is 25 MHz wide and that the center frequency of the radio channel can be assigned to different points (channels) in the 96 MHz industrial, scientific, and medical (ISM) unlicensed frequency band. This example shows that there can be up to 3 non-interfering (non-overlapping) 802.11b radio channels operating in the same ISM frequency band. This figure shows a typical trunked SMR system. In this example, there are several available radio channels. Mobile radios that operate in this system that wish to communicate may search for an available radio channel by looking for identification tones. Optionally, some trunked radio systems use dedicated radio channels to coordinate access to radio channels. Mr. Lawrence Harte has over 29 years of experience in the electronics industry including company leadership, product management, development, marketing, design, and testing of telecommunications (cellular), radar, and microwave systems. He has been issued patents relating to cellular technology. He has authored over 75 articles on related subjects and has been a speaker and panel moderator at industry trade events. Mr. Harte earned executive MBA at Wake Forest University and received his Bachelors degree from University of the State of New York. During the TDMA digital cellular standard development process, Mr. Harte served as an editor and voting company representative for the Telecommunications Industries Association (TIA) TR45.3, digital cellular standards committee. As of 2003, Mr. Harte had authored and co-authored over 20 books relating to telecommunications technology. He has served as a consultant and expert witness for leading companies including Ericsson, Siemens, VLSI, AMD, Casio, Samsung, Sony, ATT, Nokia, Hughes and many others. Mr. David Bowler is an independent telecommunications training consultant. He has almost 20 years experience in designing and delivering training in the areas of wireless networks and related technologies, including CDMA, TDMA, GSM and 3G systems. He also has expertise in Wireless Local Loop and microwave radio systems and has designed and delivered a range of training courses on SS7 and other network signaling protocols. Mr. Bowler has worked for a number of telecommunications operators including Cable and Wireless and Mercury Communications and also for Wray Castle a telecommunications training company where he was responsible for the design of training programmes for delivery on a global basis. Mr. Bowler was educated in the United Kingdom and holds a series of specialized maritime electronic engineering certificates. Avi Ofrane founded the Billing College in 1996, a training company addressing the converging market trends associated with telecommunications Billing and Customer Care. The Billing College is a spin-off company of Mr. Ofrane's technology consulting company, Jupiter Data, Inc., established in 1990. Mr. Ofrane began his career in 1977 as an analyst with the IBM Corporation and has since 1982 concentrated exclusively on the telecommunications industry, in which he is now a recognized expert in Billing and Customer Care. Throughout his extensive career, Mr. Ofrane has been involved in all aspects of the industry, from strategic planning and executive management to vendor evaluation and project implementation. Mr. Ofrane lectures extensively on Billing and Customer Care issues, strategies, methodologies, and practices. He is a frequently requested speaker at major North American and European conferences. Mr. Ofrane is currently President and CEO of the Billing College, as well as a master instructor of the company's courses. Mr. Ofrane is the co-author of the book "Telecom Made Simple" and has written numerous articles for international trade publications. Mr. Ofrane holds a Bachelor of Science in Computer Science from Pennsylvania State University. Ben Levitan, is an engineer and an expert on new and developing wireless standards for Satellite and Cellular Systems including ANSI-41, GSM, and 3rd Generation systems. Mr. Ben Levitan is an active participant for the US and international development of ANSI-41, GSM, 802.11, All-IP (3G Standards), Interstandard Roaming and FCC and US Government mandated features and requirements. Mr. Levitan has represented COMSAT, Intelsat and Aeronautical Radio, Inc. in the development of satellite standards and was a member of the United States Delegations to the United Nation's International Telecommunications Union conferences for worldwide standardization of telecommunications for eight years. Mr. Levitan is active in the development of the design of standards for the first, second and third generation of standards for wireless and cellular system, representing the engineering and business interests of GTE, Verizon International, TSI and other clients at the industry forums for development of cellular systems standards. Mr. Levitan expertise includes international roaming for cellular systems and government and FCC mandated features such as the new required Wiretap standards (CALEA), Local Number Portability and 911 emergency standards for the cellular industry. Mr. Levitan is a frequent speaker at wireless industry forums and conferences. This book provides a big picture of the key wireless industries, what systems and technologies they use, how they operate, their market trends, and what services they provide. If you are involved or you are getting involved in the wireless industry, your life is changing. The growth and decline of wireless industries can be well over 40% per year and it rapidly changes. Some wireless systems that were ?hot technologies? just 10 years ago with billions of dollars in investment with national or global presence are simply gone. This information covered in this book ranges from the basics to what?s new in wireless. You will learn that each wireless industry has its own unique advantages and limitations, which offer important economic and technical choices for managers, salespeople, technicians, and others involved with wireless telephones and systems. This book provides the background for a good understanding of the major wireless technologies, issues, and options available. The book starts with a basic introduction to wireless communication. It covers the different types of industries, who controls and regulates them, and provides a basic definition of each of the major wireless technologies. A broad overview of the telecom voice, data, and multimedia applications is provided. You will discover the fundamentals of wireless technologies and their terminology are described along with how the radio frequency spectrum is divided, the basics of radio frequency transmission and modulation, antennas and radio networks. The different types of analog and digital mobile telephone systems and their evolution are covered. Included is the basic operation, attributes and services for analog cellular (1st generation), digital cellular (2nd generation), packet based cellular (2 � generation), and wideband cellular (3rd generation) communication systems. Private land mobile radio (PLMR) dispatch and two-way radio systems are explained along with how they are changing from proprietary analog systems to advanced digital multimedia communication systems. The basics of mobile data are provided along with the available types of packet and circuit switched data systems and how they operate. Descriptions of paging systems are provided and you will discover how paging systems are evolving from one-way numeric messaging to two-way interactive information services. Important characteristics of satellite systems are covered. An overview of fixed wireless systems including point to point microwave, wireless cable, and broadband wireless is included. The fundamentals of radio and television broadcast systems are covered along with how they are converting from analog to digital systems and why in just a few years service to existing radios and telephones will stop. The fundamentals of residential cordless, public cordless and WPBX telephone systems covered. Wireless local area networks (WLANs) basics are provided including the different versions of 802.11. Short-range Bluetooth wireless is explained along with how it is used by accessories such as headsets, keyboards, cameras, and printers. The fundamentals of billing and customer care systems are provided along with these systems collect and process service and usage charges.